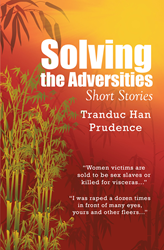 Recent release “Solving the Adversities” from Page Publishing author Tranduc Han Prudence focuses on themes of conflicts and adversities revolving around the victims during and after The Unpopular War. Tranduc Han Prudence, a member of PEN International, and author of two books on literature and history written in his native tongue, has completed his new book “Solving the Adversities”: a collection of short war stories that reflect the devastating effects of cruelty and desolation to people. Published by New York City-based Page Publishing, Tranduc Han Prudence’s riveting book opens the reader’s eyes to the reality of abuse and sufferings of victims exposed to brutality and bloodshed. Readers who wish to experience this significant work can purchase“Solving the Adversities” at bookstores everywhere, or online at the Apple iTunes store, Amazon, Google Play, or Barnes and Noble.